J.A. Boussac (L. 729b); Paris, 10-11 May 1926, lot 227. Given to Giovanni Battista Tiepolo by Knox, the present drawing may have served as the prototype for his son Domenico when the latter executed a study, now in the Museo Correr, for the left hand of one of the four Camoldolese Saints in the altarpiece now in the Museo del Castelvecchio, Verona, G. Knox, Giambattista and Domenico Tiepolo: a Study and Catalogue Raisonné of the Chalk Drawings, Oxford, 1990, p. 216, pls. 225 and 228. 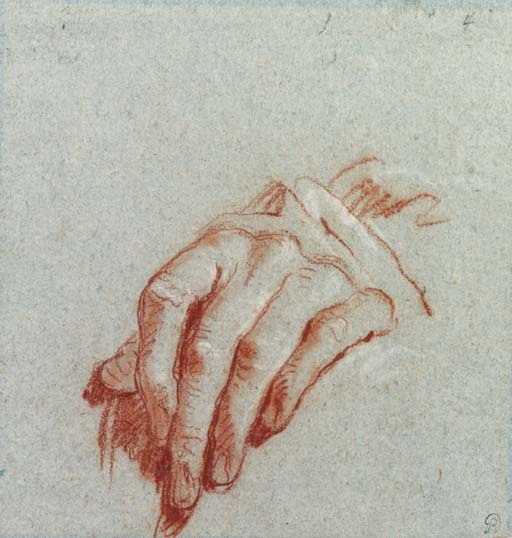 The Correr sheet has an additional hand study of the same Saint's right hand grasping a staff, confirming the attribution to Domenico.